SC Ports Authority had the highest December container volume in its history. SC Ports Authority achieved consecutive calendar years of record growth. SC Ports Authority handled 2.2 million TEUs handled in 2017. The South Carolina Ports Authority reported nine percent container volume growth in 2017 with a record-setting 2.2 million twenty-foot equivalent container units handled during the year. 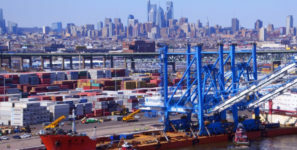 In calendar year-end results presented to the SCPA board, the port’s total container volume in 2017 surpassed the previous record of two-million TEUs achieved in 2016. The port moved 182,884 TEUs last month, an increase of 11.2 percent over December 2016 and the highest December in SCPA history. Inland Port Greer handled 7,646 rail moves in December, pushing the facility’s volumes to a new calendar year record of 124,817 total rail moves in 2017. Greer experienced 20.4 percent growth over its 2016 volume record of 103,639 rail moves. In non-containerized cargo, SCPA’s Charleston breakbulk facilities handled 75,316 pier tons in December and a total of 783,363 tons during the year. Nearly 235,000 finished vehicles moved across the dock of the Columbus Street Terminal in 2017. In addition to record-breaking volumes, 2017 was a year marked by significant advancement of key SCPA projects. Construction of the Leatherman Terminal continued, representing major growth capacity for the port’s container business when Phase One opens in 2020. During the year, SCPA celebrated the groundbreaking of Inland Port Dillon, which will open in April, and a new headquarters building, scheduled to open in December. The port also made strong progress on the final phase of the Wando Terminal Wharf Strengthening Project, which will be completed this spring in conjunction with the delivery of two new 155′ ship-to-shore cranes. The Charleston Harbor Deepening Project to 52 feet achieved several milestones in 2017, having been named one of six “new starts” and receiving $17.5 million in construction funding in the US Army Corps of Engineers (USACE) Fiscal Year 2017 Work Plan. The USACE awarded the first two construction contracts of $47 million and $213 million to deepen the Entrance Channel in preparation for dredging to begin next month. With significant completion expected by the end of 2020, Charleston will offer a wide and deep harbor, enabling SCPA to handle the biggest ships calling the East Coast and support growth of commerce in the state and region well into the future.